This review has been half written for some time now and I decided to finish it, rather then let it linger forever half-written. (plus, it feels good finishing things). “My name is Madison Avery, and I’m here to tell you that there’s more out there than you can see, hear, or touch. Because I’m there. Seeing it. Touching it. Living it. Madison’s prom was killer—literally. Now, thanks to a mysterious amulet, she’s stuck on Earth: dead but not gone. She has no idea why the dark reaper who did her in was after her, but she’s not about to just sit around and let fate take its course. With a little skilled light-bending, the help of a light reaper (one of the good guys . . . maybe), her cute crush, and oh yeah, her guardian angel, Madison’s ready to take control of her own destiny once and for all, before it takes control of her. I find the idea and the beginning were quite interesting – a YA novel with light and dark reapers, a missing body, amulets and trying to figure out who is doing what and why. There were some typically teenage parts (that can be rather frustrating) being scared of talking to other people/teens, being so very smart that never listen so in the end they turn out to be seemingly stupid for being able to make all the bad choices. 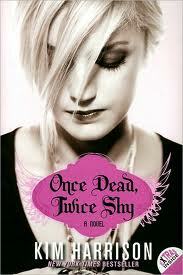 This is the first book in the Madison Avery series and I can’t say for sure that I’ll be reading on. The characters just didn’t come alive for me and the story tries to connect the paranormal and normal life in a way that didn’t make it believable for me. That said, one of the ways I decide whether a book was good is if I read it without starting to read something else – this one didn’t let me start another book (then again, it’s not very long either). I can’t say I won’t be reading on, but having so many choices at the moment, I don’t think it will happen anytime soon.